A fabulous day is starting in KC…light winds and tons of sunshine will allow highs to pop into the 60s. Can we get to 65°? A temperature that we haven’t seen since October 30th. 144 days ago. Maybe but it may be tough. We’ll be in the neighborhood though. IF there was more wind today…it would be possible. We won’t over the weekend though with another somewhat weak system moving this way. The chances through will increase later next week…the day that has the most promise is next Thursday…coincidentally timed for Opening Day! Couple of notes…one…with my change in weather shifts coming…moving to the main evening shows on Monday (3/25)…see this blog for those details…I’m going to change the name of the “weather blog” to something else. You’ll see on Monday…don’t don’t let that throw you for a loop. Same content etc…just a different name for the blog. Over the weekend…we’re going to introduce you to our newest meteorologist…his name is Garry Frank. We’re starting that transition on the 9AM show today…but you will see him doing a few shows over the weekend for me…just to sort of get his feet wet. Finally IF you’re interested in severe weather and live on the MO side…you’re running out of opportunities to get to these classes. Tomorrow starting at 8AM or so, out towards the Central Jackson Training Center in Blue Springs, a comprehensive training session will happen. The NWS will be there doing a session, I’ll be there doing a session on web sites that you can easily find to get an idea of the weather ahead…and my friend and colleague Bryan Busby from channel 9 will be there doing a presentation as well. Other folks will have presentations too. Again starts at around 8-8:30…my part is closer to 10:30 am or so. I’ve known Garry for years…he’s from KC…grew up here and has worked in Yuma, AZ and then Grand Rapids, MI. He’s a great guy and I’m pretty sure he’s going to work out wonderfully over the weekends as I step away from the weekend shift. You’ll see him every so often during the weekday evening shows as well just to fill out his schedule a bit. More on that in a future blog. So with all that taken care of…let’s move along to the world of weather. This is a “thing”. The lack of 65° days since 11/1. We’re still waiting for a high that equals that or exceeds that. Odds heavily favor this happening by the end of next week! To go this long, since 11/1…during the fall>spring seasons has NEVER happened before. Note which year is #2…1993…the flood year (interesting). 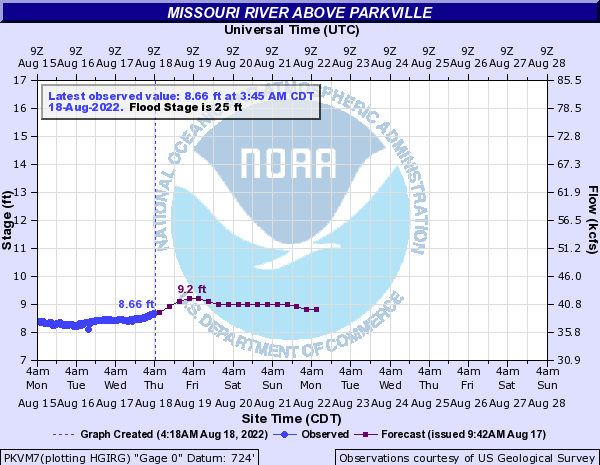 Taking that even farther…in ’93 we had 51.5″ of precipitation…in ’98 we had 49.5″ and in 2001 we had 53.5″. As a matter of fact when looking at the top 7 years above…5 of them had pretty healthy precip totals for the year…(even more interesting). We’re well on our way this year too…with 5.5″ of moisture which is about 1.5″ above average…and more to come this weekend. Back to the original premise of the blog…the lack of “mild” days…so let’s expand that even more…and this rehashes and updates what I wrote about earlier in the week. The lack of 75° or higher days is NOT surprising…but down from there..you can see how “cool” it’s been in another way. Hopefully we start to right the ship over the next few weeks. If you’re wondering why we’re having a delayed spring…that’s it right there. Obviously spring is running behind although I think a lot of you are itching to get out and do some things in the garden. 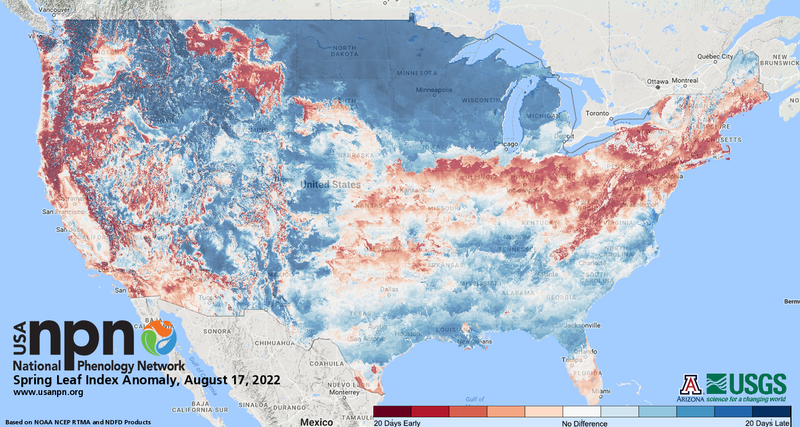 That blue shade…indicating how far behind average spring “leaf-out” is running is about to come to 10-20 days behind schedule over the next week or so in the KC region. Some rain…not a ton expected…tomorrow sort of iffy as we take a bit of time to saturate the atmosphere and with weak forcing to get rain going…the showers will be out there but perhaps not overly heavy. The better chances arrive after lunch although a few sprinkles/showers are possible near daybreak, especially on the KS side. 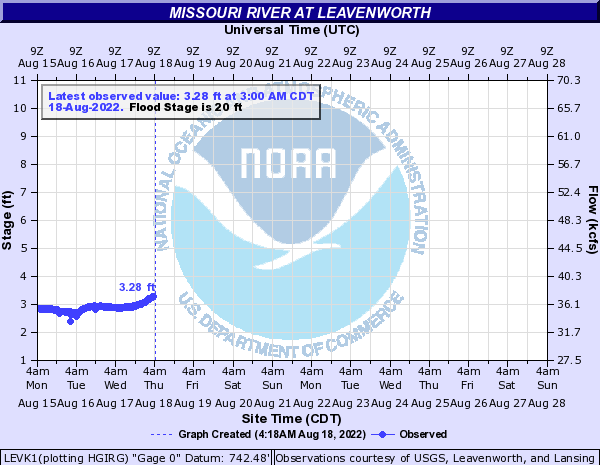 This system will note increase the river stages to any significance, as a matter of fact the rivers will mostly be coming off their crests over the weekend from KC upstream. 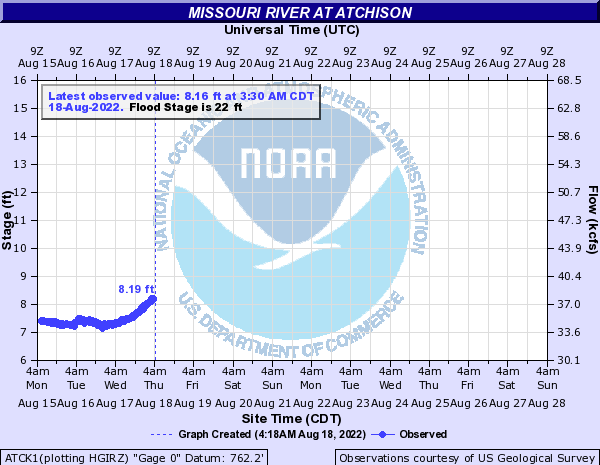 Once we go downstream towards the east of KC…the rivers will be on the upswing as all the water moves through. 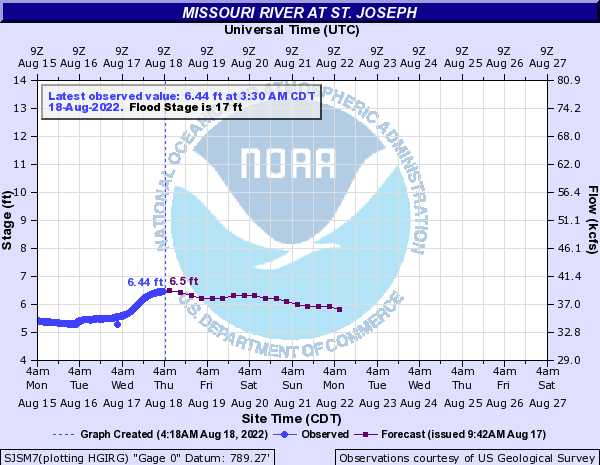 Last night I calculated that based on the rate of flow of the MO River through St Joseph…the waters were running at the rate of 121 MILLION gallons per MINUTE. That’s a ton of water. 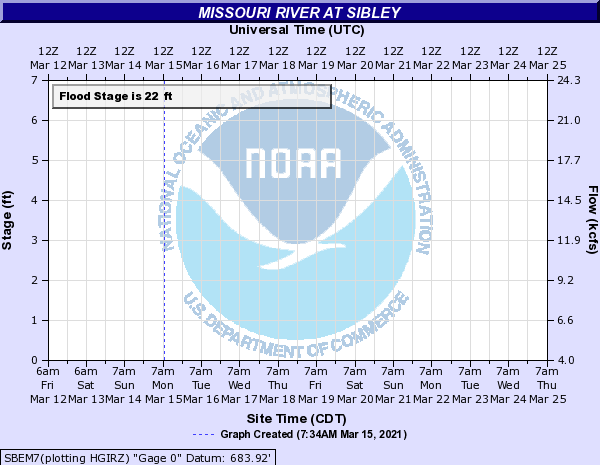 It should be noted that 30 foot crest out towards Sibley falls into the top 6 of highest crests.